With 38 days to go before the Fed’s September rate decision, we see some signs of risk aversion in markets and continued signs of weak growth outside our borders. Here are just a few examples. Credit spreads spiked last week, as the difference between the Moody’s Baa Corporate Bond Yield®, which acts as a credit index, and the long-term U.S. Treasury bond spiked above 230 basis points (it was 180 basis points back in April). There is a growing number of declining equity issues across the various U.S. exchanges relative to advancing issues. A good portion of this turbulence can be traced to growing concerns over global growth along with a pickup in currency and commodity price volatility. The latest leg down for commodity prices, for example, are seen in oil (which broke below $50 last week and is down from $110 a year ago), and industrial metals, including copper (-26% year-over-year), steel (-36% year-over-year), and aluminum (-21% year over year). In many cases, slowing growth in China is contributing to already weak non-U.S. demand for commodities. In addition to importing less, China is also shipping more commodities into already oversupplied world markets, further lowering prices, and hurting both commodity producers and those countries whose economies rely heavily on revenue from commodities. Higher-risk stocks are now lagging lower volatility shares as a style preference for investors. The Treasury curve has flattened modestly as expected real rates are rising sharply and inflation expectations priced into the TIPS market have again begun to fall. Latin American economies, such as Brazil, Chile, Columbia, and Uruguay, are all experiencing mounting trouble from the commodity price collapse, China’s slowdown, and the impending Fed rate hike. Making matters worse is the fact that Latin American growth is essentially 0% and inflation is accelerating. Brazil, whose currency has fallen by 25% this year, is experiencing inflation near 9%. All of this increases the complexity of policy decisions for these countries, as hard choices need to be made between supporting weak economies and risking higher inflation or attempting to reign in inflation while risking an even worse economic downturn. The flip side of this is that the U.S. becomes even more appealing by contrast for global investment and capital flows. This could have the effect of further strengthening the dollar and accelerating investment in U.S. real and financial assets. This, too, could complicate the Fed’s efforts, as they seek to dial back ulta-accommodative monetary policy on their own terms and timetable. Although China continues to rebalance its economy with more Gross Domestic Product (GDP) coming from domestic consumption and services, China is downshifting to a much lower growth rate than what we saw since 2000. As this happens, we think China will struggle with a variety of issues. The property sector will remain a drag, for example. The combination of a stronger currency and higher wages will chip away at some of the country’s manufacturing competitiveness. Elevated corporate leverage following a long credit cycle exposes a variety of potential risks. Fiscal constraint likely will continue to rise. In addition, recent issues including a falloff in non-U.S. demand and a sharp pickup in stock market volatility will also pose drags and risks as we move toward 2016. China’s troubles are obviously contributing to the pickup in global risk aversion this year and dampening year-to-date returns for equity indices such as the Dow Jones Industrial Average (Dow) and S&P 500. We are hopeful that growth will pick up toward mid-year. On the positive side, we are happy to see the 0.9% drop in the unemployment rate since this time last year, as it suggests that final demand here should be able to continue apace. Of course, the steady improvement in jobs is not lost on the Fed either, which seems intent upon moving forward with their first rate increase in over a decade despite the aforementioned pickup in financial market jitters and the challenges still confronted by our trading partners. Just last week, Dennis Lockhart, a typically centrist member of the Federal Open Market Committee (FOMC), commented that the U.S. economy would have to suffer a “significant deterioration” for him not to support a September 17 rate hike. Overall, our view has not changed despite continued progress on the domestic economy. We still see a mixed bag of data once we incorporate real-time market based indicators and foreign inputs to our data analysis process. First-half growth was weak, and our base case calls for an improvement in the back half of the year. 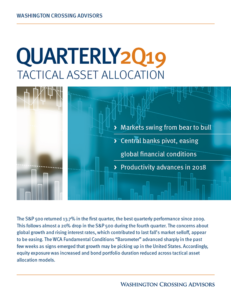 From a tactical perspective, we need to see further evidence of improvement before increasing our equity allocation, however. From a security selection perspective, we are noticing that companies with higher-risk profiles are now exhibiting signs of fatigue after a two-year “risk on” environment. Consequently, we have been making select substitutions where we can find better quality at still-reasonable valuations. S&P 500 companies are tracking toward a 1% earnings decline for the quarter. Currency issues, weakness in Europe and China, and commodity pressures are all contributing factors toward the weakness. Still, there is hope that earnings will pick up from here as the dollar’s advance fades, commodity prices find a floor, and global growth picks up into 2016. Analysts are looking for $127.40 in earnings over the next 12 months, putting the forward P/E ratio at 16.3x — 15% above the 10-year average. Net income margins are also elevated (but falling) with 9.7% expected versus a 10-year average of 8.7%. 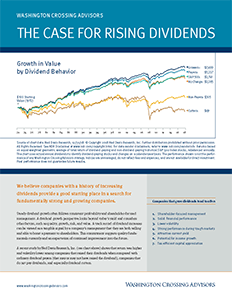 Mean reversion of both of these measures would drag on returns which will rely more on underlying growth, dividends, and buybacks as drivers of return.